Just as homeowners do, it’s important for businesses to get their properties ready for the coming winter months – and fall is the perfect time to do this, when temperatures outside aren’t scorching hot. 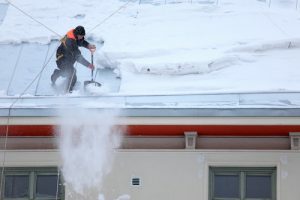 As commercial roofing professionals, we have a list that will help you prepare your Atlanta commercial property for whatever the winter season may bring. Check the roof to make certain there aren’t any issues that need to be addressed. If you aren’t comfortable doing it yourself, our commercial roofers are happy to perform an inspection. In the Atlanta area, you never know what winter will bring – from rain and sleet to occasional snow. Detecting any small problems will make it possible to perform any necessary repairs before it becomes a more costly issue. Check for drafts. Air leaks often occur when there are gaps or cracks around doors or windows. This results in higher heating costs, not to mention it compromises the comfort of you, your employees, or tenants that may be leasing your property. Caulk and weatherstripping are the most common ways to repair gaps, holes, or cracks that leak air. If you have an irrigation or sprinkler system, drain it of water and shut it down once the watering season is over. Properly winterizing your sprinkler system will give you peace of mind, knowing it will function properly come spring, and that it is protected against possible damage. Inspect your entire property on a regular basis. From the exterior walls and foundation to windows, doors, gutters, etc. it’s important to check your entire property for damage. When you don’t look closely at all aspects of your property, you likely won’t notice a potential problem until it becomes obvious – and more expensive to repair. If you have a property that is unoccupied, set heating to a low temperature. We often forget the fact that freezing temperatures can result in busted water pipes. These are a few of the things you should considering doing to prepare your commercial property for the coming winter months. An ounce of prevention is worth a pound of cure! Kelco Roofing is a commercial roofing company in Atlanta, dedicated to quality and customer satisfaction in everything we do. For all of your roof repair, inspection, or installation needs count on Kelco to deliver beyond your expectations.